﻿NorthConnex: an end to Either/Or? New roadways, especially freeways, rarely get a good press. As a result, they attract a lot of political opportunism. The new Victorian government was elected promising to scrap the proposed East West Link, despite broad agreement that it was necessary, despite broad public support and despite a potential penalty for breach of contract of well over $1 billion. 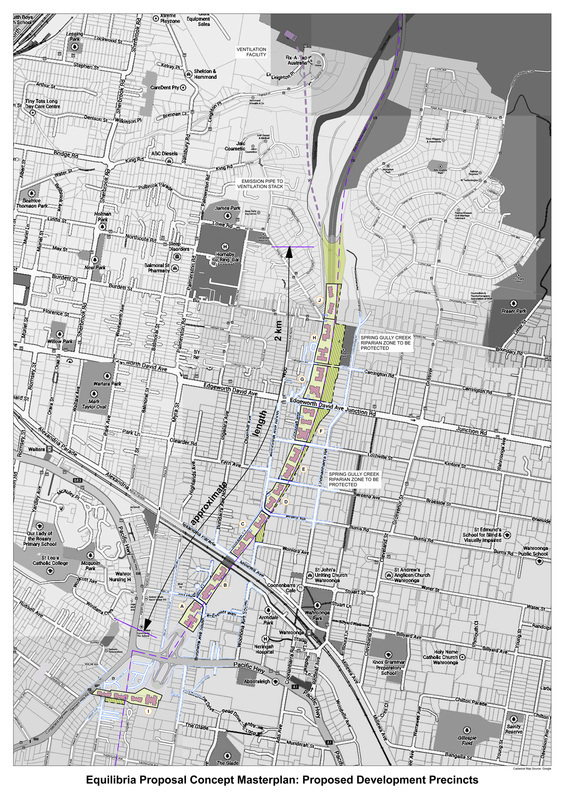 In Sydney, the WestConnex has hit headwinds ─ largely due to its potential impact on King Street, Newtown ─ and the Labor opposition has obligingly come out with a substantially modified version. The verso of new roadways is always more public transport. But when the NSW government proposed a light rail link between the city and Kensington via Surry Hills, there was also a nimbyoutcry. Not for nothing does British urbanist, Charles Landry, describe Australia as “the land of No”. And despite otherwise declining birth rates, Australian naysayers seem to be proliferating. North of Sydney is another proposed freeway ─ apparently proceeding ─ the NorthConnex, which is designed to provide the long-missing connection between the M2 motorway coming in to Sydney from the west, and the M1 which heads north to Newcastle. This was an unsolicited proposal from Victorian-based Transurban (in association with Lend Lease Bouygues). 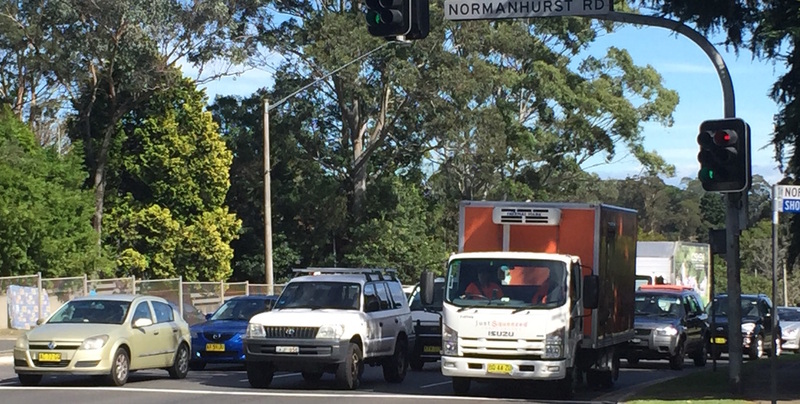 The idea is for a tunnel linking the two motorways, providing a bypass for east-west traffic and taking traffic, especially trucks, off the appallingly congested Pennant Hills Road. As Tim Blight pointed out in a blog in May 2014, this is really just the latest in a series of proposals dating back to the 1970s. And as Blight also points out, the context for all this is the rapid development of Sydney’s northern suburbs involving greater densification. While he agrees that a link between the M1 and M2 is necessary, Blight disagrees with the routing of the link, partly because it does not address the rapidly growing congestion on the Pacific Highway and partly because he argues that it will be a white elephant once the orbital M9 is built, allowing north-bound traffic to bypass Sydney. Otherwise, there has been concern about exhaust emissions. The current proposal employs ‘longitudinal ventilation’. In other words, with the help of ceiling-mounted jet fans, the moving vehicles push the emissions towards the two exit points which each has an emissions stack. There is great concern, backed by independent medical evaluation, about the northern stack which is in a highly populated area, including over 9,000 school children within a 1.5 kilometre radius. The NSW government has responded to this concern by requiring a higher stack. But many believe this is not sufficient. Architect, Peter Georgiades, supports the scheme in principle, but is concerned about the public health issues. He believes the emissions issue affects not just the people living around the northern stack, but also the drivers using the tunnel. What makes Georgiades’ proposal interesting is not just that it offers an alternative, but also a scheme which brings with it added social value. Longitudinal ventilation is cost-effective and efficient in tunnels up to 5 kilometres in length (such as Sydney’s M5), but generally used only in tunnels of no more than 2 kilometres. The alternative for NorthConnex, says Georgiades, is a horizontal tunnel (generating far fewer emissions) using transverse ventilation (as in the Sydney Harbour Tunnel and many tunnels in Europe). In this case, air would be delivered and extracted uniformly over the length of the tunnel. The air flows ‘transversely’ across the traffic space with fresh air injected from the sides of the tunnel with air extracted above the traffic space. 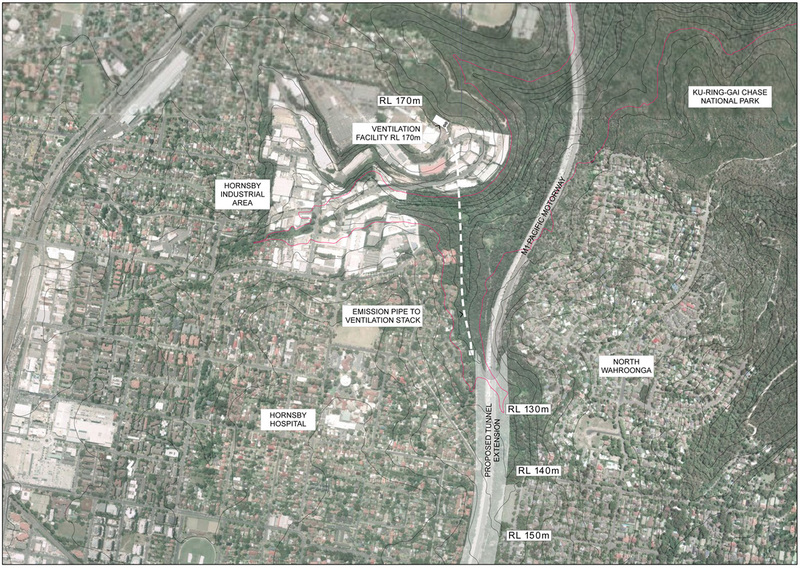 Georgiades argues that a horizontal tunnel is feasible because the topography supports it, with the RL at the M2 being 130 metres and the RL just north of the Wahroonga residential area also 130 metres. His proposal is for the tunnel to be extended an extra kilometre to the north with an exit point in the Hornsby Industrial Area, beyond the major residential area of Wahroonga. The extension would also obviate residential resumptions and the destruction of the Spring Gully Creek riparian zone adjacent to the M1. Naturally, this would come at a substantial extra cost which has so far been the basis for rejecting the alternative proposal. But this is where Georiades’ scheme becomes interesting because he and his team have come up with a blueprint which would not only fund the alternative model, but add social value by addressing the increasingly pressing issue on the upper North Shore of population density and adequate housing. Extending the tunnel would free up 2 kilometres of now redundant M1 to be re-zoned residential.This would accommodate up to 2,000 dwellings over ten separate land precincts totaling approximately 100,000 square metres as well as re-uniting the suburb of Wahroonga, currently divided by the M1. Georgiades team’s financial analysis suggests that not only can the extension and transverse ventilation be paid for through such a scheme, but that the estimated $450 million raised from the land sale be given over to Transurban to pay for the tunnel extension. If this did not cover the cost, then an extension to the toll concession could be granted to cover the shortfall. All of this suggests a win-win solution ─ a refreshing alternative to the usual stand-off between doing what needs to be done at any cost and simply saying No to every proposed development. Oh, for a little consensus and responsive and responsible policy-making. And, oh for an end to the dumb Australian either-or mentality.